Only a handful of employees still smoke or use tobacco, right? Shouldn’t that mean it’s no longer a significant problem for your organization? Granted, only around 19 percent of the overall U.S. population still smokes and you’d think that with all of the “quit now” promotions and products available to them, smokers would gladly find ways to quit. After all, the health problems are no longer debatable; the cost of smoking cigarettes is astronomically high; and smokers are not simply “unsocial,” they’ve become social outcasts. But that 19 percent represents an addiction that is incredibly difficult to kick. It includes smokers who have tried to quit countless times without success or who just aren’t ready to give it up. That makes getting people to quit smoking that much harder. So, why should employers care about helping employees to quit smoking? 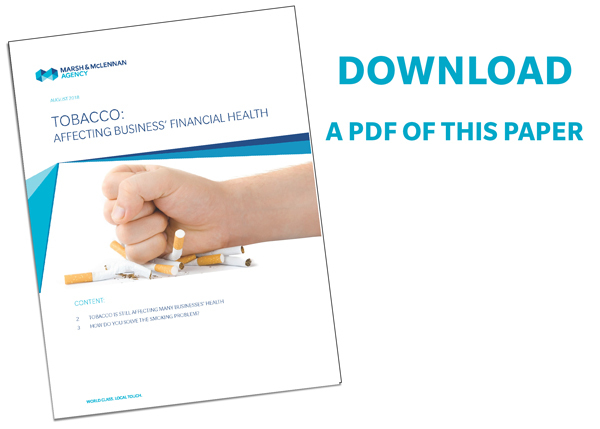 Every tobacco user in your employee population is costing you approximately $6,000 every year in health care and workers’ compensation costs — and that’s above and beyond the standard per-employee cost. Tobacco-related illness costs the health care system more than $300 billion a year, including more than $175 billion in direct medical care costs and a further $156 billion in lost productivity. Tobacco users cost companies every time they step outside to take a smoking break in lost productivity. According to a study done by The Ohio State University, tobacco users account for abnormal amounts of absenteeism and, because of chronic health problems, cause presenteeism problems as well. Tobacco users are often not recommended for surgery because of complications from smoking, and those who do get surgery often take additional time to heal — or can’t heal properly. This causes problems with returning employees to work in a reasonable time and that costs the company money. It’s a sad fact: employees who use tobacco are not only risking their own health, they’re risking your money. And the problem isn’t getting noticeably better; it looks like it could get worse. Smoking overall has been on the decline for the past two decades, but the number of high school students who smoke has actually gone up due to the availability of e-cigarettes and vaping. This “non-tobacco” smoking causes its own significant health problems including “popcorn lung,” a scarring of the tiny air sacs in the lungs that results in the thickening and narrowing of the airways. It's a serious lung disease that causes coughing, wheezing and shortness of breath similar to chronic obstructive pulmonary disease (COPD). And it’s currently untreatable. Worst of all, youths who use e-cigarettes are twice as likely to eventually take up cigarette smoking. How Do You Solve the Smoking Problem? The difficulty in getting the remaining 19 percent of smokers to quit is that many of them have already tried and failed, possibly multiple times. Or they are simply fighting the obvious need to give up cigarettes. Marsh & McLennan Agency has developed a tobacco cessation class call The Courage to Quit taught by highly trained, certified Tobacco Treatment Specialists. The program is a high-intensity, evidence-based, cognitive behavioral treatment to end nicotine dependency. The Courage to Quit is built around a personal approach to quitting, rather than a one-size-fits-all attempt. And it works. By understanding the science behind tobacco addiction, we have been able to reach individuals for whom smoking cessation appeared to be an insurmountable problem and successfully helped them quit. The Courage to Quit begins by measuring the carbon monoxide and blood pressure numbers of each individual participant. We’ll use that as a benchmark to track success. Next, we talk with each participant about why they smoke, when they have cravings, what their “triggers” are that cause them to want a cigarette, why it’s hard to quit, and how they’ll need to prepare to succeed. We also discuss lifestyle changes and overcoming obstacles, and help each individual assess their situations and make dedicated plans. Then we track and measure success. And finally, we celebrate. Smoke-free employees are happier. They’re healthier. And they cost their employers less in health care and workers’ compensation costs. (Remember, you can save $6,000 per employee who quit using tobacco.) They return to work faster after injuries. They have fewer sick days. And they’re more engaged in their work. The Courage to Quit program is a proven way to help employees become tobacco-free. To learn more about how it works and how well it has succeeded, talk with your Marsh & McLennan Agency representative.